Closing entries, also called closing journal entries, are entries made at the end of an accounting period to zero out all temporary accounts and transfer their balances to permanent accounts. In other words, the temporary accounts are closed or reset at the end of the year. This is commonly referred to as closing the books. Temporary accounts are income statement accounts that are used to track accounting activity during an accounting period. For example, the revenues account records the amount of revenues earned during an accounting period—not during the life of the company. We don’t want the 2015 revenue account to show 2014 revenue numbers. Permanent accounts are balance sheet accounts that track the activities that last longer than an accounting period. For example, a vehicle account is a fixed asset account that is recorded on the balance. The vehicle will provide benefits for the company in future years, so it is considered a permanent account. At the end of the year, all the temporary accounts must be closed or reset, so the beginning of the following year will have a clean balance to start with. In other words, revenue, expense, and withdrawal accounts always have a zero balance at the start of the year because they are always closed at the end of the previous year. This concept is consistent with the matching principle. Temporary accounts can either be closed directly to the retained earnings account or to an intermediate account called the income summary account. The income summary account is then closed to the retained earnings account. Both ways have their advantages. Closing all temporary accounts to the income summary account leaves an audit trail for accountants to follow. The total of the income summary account after the all temporary accounts have been close should be equal to the net income for the period. Closing all temporary accounts to the retained earnings account is faster than using the income summary account method because it saves a step. There is no need to close temporary accounts to another temporary account (income summary account) in order to then close that again. Both closing entries are acceptable and both result in the same outcome. All temporary accounts eventually get closed to retained earnings and are presented on the balance sheet. 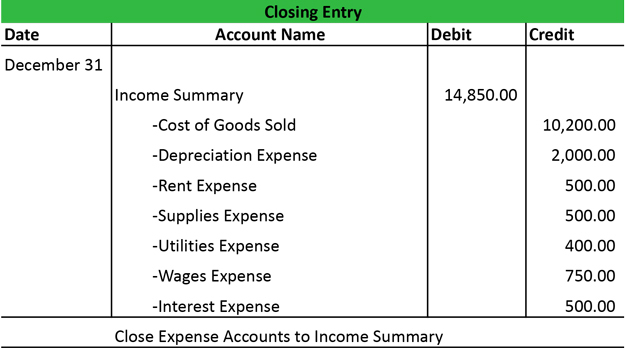 In this example we will close Paul’s Guitar Shop, Inc.’s temporary accounts using the income summary account method from his financial statements in the previous example. There are three general closing entries that must be made. All of Paul’s revenue or income accounts are debited and credited to the income summary account. This resets the income accounts to zero and prepares them for the next year. Remember that all revenue, sales, income, and gain accounts are closed in this entry. Paul’s business or has a few accounts to close. All expense accounts are then closed to the income summary account by crediting the expense accounts and debiting income summary. Since dividend and withdrawal accounts are not income statement accounts, they do not typically use the income summary account. These accounts are closed directly to retained earnings by recording a credit to the dividend account and a debit to retained earnings. Now that all the temporary accounts are closed, the income summary account should have a balance equal to the net income shown on Paul’s income statement. Now Paul must close the income summary account to retained earnings in the next step of the closing entries. 1 What are Closing Entries?